The dough is made with a particular cultivar of non-modify Italian wheat, Senatore Cappelli, grown on virgin land which has not been cultivated for years. 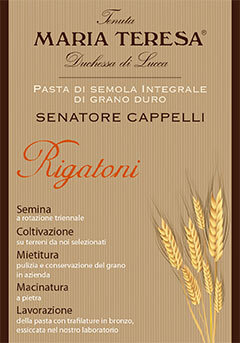 The Senatore Cappelli is an ancient variety of wheat (obtained in 1933) of superior quality, non-modified, with a low productivity index (15 tons per hectare against 60 tons for modern varieties) characterized by unique nutritional characteristics and high quality. We do not use any chemicals throughout the cultivation chain, from soil preparation, during growth, nor when cleaning and even when storing our wheat in silos. The flour resulting from our wheat has a low gluten content and since it is stone-ground the particle size is not uniform. This pasta is drawn using bronze dies and dries very slowly, which makes it rough and porous. When drawing stone-ground flour, with variable grain size, low gluten content (therefore less elastic), the consistency and compactness of the pasta are variable. Therefore, it must be cooked in a delicate manner, bringing the water to a boil and then reducing the same to a minimum before adding the pasta into it. We recommend simple sauces that do not involve vigorous stirring. Otherwise we suggest to cook it like a risotto, together with the sauce in a pan with a constant addition of water or other liquid when needed. The combination of stone grinding, slow drying and a low gluten content calls for a short cooking time, between 4 and 6 min depending on the shape, much shorter than that of industrially produced pasta. – Pasta “as you like it”, but always following the above described procedure. – Recommended wines: Tenuta Maria Teresa “Urlo di Lupo” IGT Toscana Rosso, Tenuta Maria Teresa “Leudo” IGT Toscana Bianco.